1. Every year, there are trillions of searches on Google and over half of those searches happen on mobile. More searches happen on mobile than on desktop computers – which is no surprise when we think about our own behavior as consumers. Throughout the day, whenever we want to buy, learn or go, we turn to our phones first. 2. Mobile is local. Nearly one third of all mobile searches are related to location, and that number is growing. Whether they’re researching pizza delivery on Friday night or trying to find an orthodontist near their pre-teen’s middle school, consumers are using mobile to direct their actions in the local world. Thirty-two percent of consumers say that location-based search ads have led them to visit a store or make a purchase1. For small business serving customers in their area, mobile ads can offer a vital opportunity to connect with customers. 3. 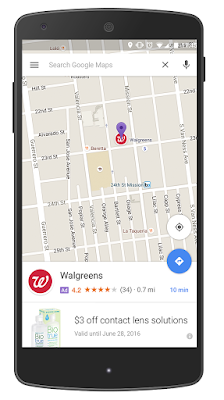 New local search ads help businesses bring customers right to their door. As we announced at the Google Performance Summit, businesses using location extensions in AdWords can prominently display their business location when consumers search for things like “dentist” or “car repair shop near me” while on-the-go. We’re also testing new local ad formats that make it easier for users to find businesses as they navigate on Google Maps. Consumers may start seeing experiments like promoted pins that allow businesses to strengthen their brand presence in maps. 4. AdWords is designed to help you succeed in a mobile-first world. New expanded text ads in AdWords provide extra ad space so you can showcase more information about your products and services before the click. The key changes include more prominent headlines and a longer description line in your text ad. Responsive ads for display will adapt to the diverse content, shapes and sizes of the more than two million publisher sites and apps on the Google Display Network. Just provide headlines, a description, an image, and a URL, and AdWords will create beautiful ads for you that looks good on every device and site. To learn more about other exciting ads and analytics innovations announced at the Google Performance Summit, watch the livestream keynote here.